A Viking embroidery motif. Biblical narratives often use imagery with similar patterns of repetition. A motif is a recurring pattern or design, or a familiar image that is repeated in a piece of writing. In my last post on “Helpful Suggestions for Bible Study,” I focused on the importance of paying attention to the details of a story (you can read that post here). Another detail that is often overlooked in Bible study is the recurrence of motifs within a story, or even a whole book. Biblical narratives commonly use motifs. These motifs spice up a story and not only increase the “entertainment” value of the story, but usually contribute to the understanding of an important theme, message, or character within the narrative. This is a “detail” worth pondering, and so I would like to take the opportunity in this article to look at various stories and the motifs found in them. With some stories, the reason for the motif is obvious. With other stories, the reason for the motif is more obscure. In this article I will explore the meaning of some motifs while asking all of you who read this blog to offer insights and suggestions about others. I hope you’ll join me by sharing your comments. So let’s have some fun exploring various motifs in biblical narratives and see what we might learn from them. A stone becomes Jacob’s pillow and that night God appears to him in a dream. Stones are a common motif in some biblical narratives. For example, the story of Jacob, in the Book of Genesis, frequently refers to them. 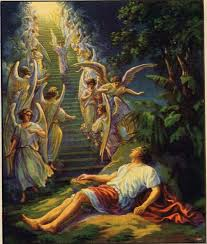 When Jacob has his famous dream of the “ladder” that reaches from heaven to earth, we are told that he uses a stone for his pillow (Gen. 28:11). The following morning he takes the same stone and sets it up as a sacred pillar (yes, his pillow becomes a pillar) for a memorial of the occasion (Gen. 28:18, 22). The stone here is obviously a motif that suggests God’s provision, protection, and blessing on Jacob, as he flees from his brother Esau and goes to Syria where he will meet his future wives (Leah and Rachel) and encounter his diabolical uncle Laban, but it also suggests Jacob’s lack of certainty about God. Upon Jacob’s arrival in Syria (Paddan Aram), he comes to a well which has a large stone that covers it (Gen. 29:2). The narrator spends several verses talking about this stone and the shepherds’ reluctance to remove it quickly (Gen. 29:3, 8). However, when Rachel arrives on the scene and Jacob sees her for the first time, we are informed that he rolls the stone away by himself and waters the flocks (Gen. 29:10)! The contrast between the lazy shepherds and the energetic Jacob, the heaviness of the stone and the appearance of Rachel, seems to suggest that Jacob is showing a little machismo and flexing his muscles for the little beauty he has just met! In this case, the stone represents Jacob acting in the flesh. Up to this point in the story it must be admitted that Jacob relies on himself, rather than on God. Jacob secures Rachel as a wife by showing off, working hard, and bargaining with Laban (Gen. 29:18-19). It is all done in his own strength. By contrast, his father Isaac had received his wife through the fervent prayer of Abraham’s servant who sought God’s guidance each step of the way (Gen. 24). Jacob never prays about a wife. He flexes his muscles, works hard, and negotiates. After years of mistreatment at the hands of his father-in-law, stones reappear again in the story of Jacob as he and his family flee from Laban. The stones in this story represent a covenant (Gen. 31:44-46), but the covenant is based on hostility and mutual mistrust (Gen. 31:51-52). For Jacob they also appear to have the deeper meaning of recognizing God’s protection over him (Gen. 31:53). In Genesis 35, Jacob finally returns to Bethel (where he had his original dream). God appears to him and reiterates all of the promises He had made to Jacob. When God is finished speaking, the Scripture tells us that Jacob set up a “pillar of stone” to commemorate where God had talked with him (Gen. 35:14). This scene brings the story full-circle demonstrating both God’s faithfulness to Jacob and Jacob’s trust in God. 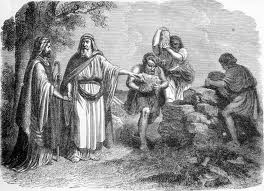 The first stone pillar at Bethel (Gen. 28) was set up by a lying and deceitful Jacob who trusted in his own wits and strength. The final stone pillar at Bethel (Gen. 35) is set up by a Jacob who has learned humility, trust, and dependence on God. Jacob’s trust in God is declared one final time through this “stone” imagery. On his deathbed, as he is blessing his son Joseph, Jacob refers to God as “the stone of Israel” (Gen. 49:24). Thus by following the “stone” motif in the story of Jacob we can not only discover significant insights into the personality of Jacob, but we can discover the message of how God transforms a self-sufficient man into one who depends on Him. Saul’s spear was his constant companion and is an example of another literary motif in a biblical narrative. Another motif that Bible commentators frequently draw attention to is the spear of Saul. Following the story of David and Goliath, a spear becomes Saul’s constant companion (1 Sam. 18:10-11; 19:9-10; 20:33; 22:6; 26:7-22). Some wonder about the frequent reference to Saul’s spear but have no explanation for it. Others suggest that it is a sign of his kingship. To a certain extent this is true, but this insight needs to be taken further. The real key to understanding the significance of Saul’s spear is found in David’s statement to Goliath, “You come to me with a sword, a spear, and with a javelin, but I come to you in the name of the Lord of hosts” (1 Sam. 17:45). Most significantly, David states, “Then all this assembly shall know that the Lord does not save with sword and spear; for the battle is the Lord’s, and He will give you into our hands” (1 Sam. 17:47). David’s statements to Goliath cast a shadow over one who puts his trust in a sword or a spear. As mentioned above, it is after these statements by David that the biblical narrative constantly draws attention to the spear that accompanies Saul. The spear becomes a symbol of Saul’s trust in the flesh and his lack of trust in God. This is especially clear when he attempts to use this spear to rid his kingdom of David, God’s anointed (1 Sam. 18:10-11; 19:9-10). Thus, Saul’s spear represents his conflict with God. By seeking to kill David, he is opposing God and God’s plan for the kingdom. This is part of the significance of David taking Saul’s spear (1 Sam. 26:7-22). 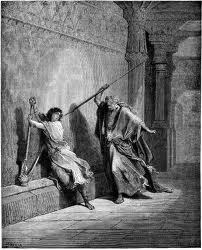 God (through David) disarms Saul and demonstrates who the true king of Israel is. Reflecting on the people’s original request for a king (who turned out to be Saul), we are reminded that they asked for a king “to judge us like all the nations” (1 Sam. 8:5). Saul’s trust in his spear rather than in God, suggests that he is a king “like all the nations” and, therefore, the people got the kind of king that they asked for! Samson sets the Philistine fields on fire. Samson’s name is from the Hebrew word for “sun” and fire is a recurring motif in his story. When Samson’s wedding guests are not able to solve his riddle, they threaten to burn his wife and father-in-law with fire (Judg. 14:15). 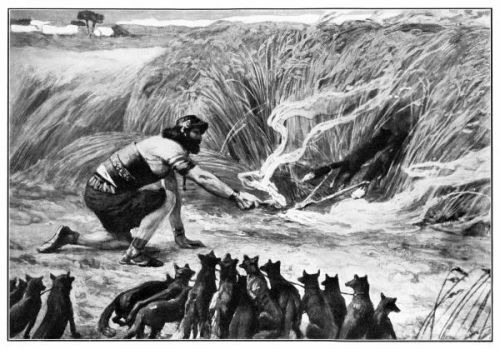 The most famous incident involving fire in connection with Samson is when he captures 300 foxes, ties torches to their tails and releases them into the fields of the Philistines to destroy their harvest (Judg. 15:5). In retaliation for this incident, the Philistines fulfill their threat against his former wife and father-in-law by burning them with fire (Judg. 15:6). After Samson responds by attacking more Philistines, they demand that the tribe of Judah hand him over. Samson agrees to allow his fellow-Israelites to tie him up, but when he is handed over to the Philistines we are told, “Then the Spirit of the Lord came mightily upon him; and the ropes that were on his arms became like flax that is burned with fire” (Judg. 15:14). Similarly, when Delilah ties Samson up with bowstrings and says “The Philistines are upon you Samson,” he breaks the bowstrings, “as a strand of yarn breaks when it touches fire” (Judg. 16:9). What we are to make of all of these references about fire, and Samson’s name (which actually means “little sun” or “sunny”) is uncertain. However, fire is clearly a motif of the story. Because many in the ancient world worshipped the sun, some see Samson’s name in a negative light (no pun intended!). Certainly, he was the worst of the Judges. But in spite of his self-indulgent ways, he does bring partial deliverance to Israel. The fire motif is connected with this theme of deliverance from the Philistines. So what should we make of this motif in the story of Samson? I would be interested in hearing what some of you think. 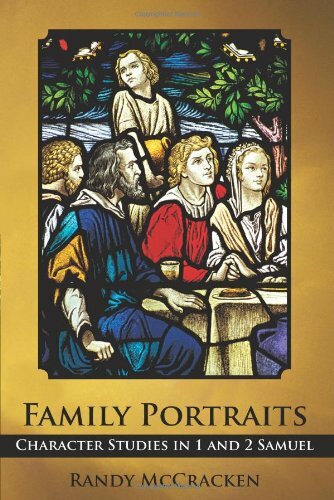 I find the motifs of various biblical narratives an interesting way to approach Bible study. I’ve even thought of one day writing a book on some of the motifs of 1&2 Samuel. We have already looked at the motif of the spear in 1 Samuel. Let me conclude this article by mentioning two more. The motif of feet and lameness appears in the early chapters of 2 Samuel. Asahel is said to be “fleet of foot” (2 Sam. 2:18), while David laments the death of Abner by stating, “Your hands were not bound; Nor your feet put into fetters” (2 Sam. 3:34). In 2 Samuel 4:4 we are introduced to Jonathan’s son Mephibosheth who is “lame in both feet.” In 2 Samuel 5 when David attacks Jerusalem, the Jebusites taunt him by saying “You shall not come in here; but the blind and the lame will repel you” (2 Sam. 5:6). More talk about the blind and the lame continues in 2 Sam. 5:8. By the end of 2 Samuel 9, Mephibosheth, the man lame in both feet, is sitting at the king’s table (2 Sam. 9:13). Mephibosheth, the man lame in both feet, eats at the king’s table. 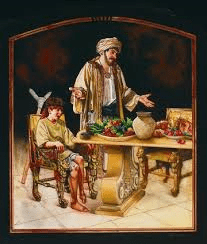 Speaking of the king’s table, another very interesting motif that runs through the entire narrative of 1&2 Samuel, is the motif of eating and not eating. This motif is so widespread that I will only mention a few examples (for a fun study, see how many others you can find!). In 1 Samuel 1:8 Hannah refuses to eat. In 1 Samuel 2, Eli and his sons cannot help but eat everything in sight, including the sacrificial meat that belongs to God (1 Sam. 2:12-17; 27-30). There is definitely a contrast being made between Hannah who refuses to eat what she is entitled to, and Eli and his sons, who eat what they are not entitled to. Other examples include: Saul putting the army under a vow of fasting until he defeats the Philistines, but Jonathan eats some honey unaware of Saul’s command (1 Sam. 14:24-30); Jonathan refusing to eat at the table with Saul because he is grieved over Saul’s desire to kill David (1 Sam. 20:34); Saul’s visit to the “witch” at Endor where he is persuaded to eat after initially refusing (1 Sam. 28:20-25); as noted above, Mephibosheth is invited to eat continually at King David’s table (2 Sam. 9:7-13); David refuses to eat as he prays for the child that Bathsheba has given birth to, but once the child dies, David eats (2 Sam. 12:16-23); and Amnon requests food from his sister Tamar, but then refuses to eat it (2 Sam. 13:5-11). These are only a few of the many stories that contain the theme of eating and not eating in 1&2 Samuel. This motif seems to have different meanings depending on the context and I look forward to exploring it in more depth in the future. Meanwhile, if you have any thoughts regarding this motif or others not mentioned in this article, I would welcome hearing them. Hopefully this brief survey of a few of the motifs in biblical narrative will encourage you in your Bible study. The Bible speaks at many different levels and motifs can be an interesting way of entering into the meaning of a story. Samson and the Gaza Prostitute: Did He or Didn’t He? Previous PostRobert B. Chisholm Jr’s Comments on Violence in the Old TestamentNext PostJews and Greeks in the First Century A.D. Thanks Randy! I really enjoyed this article and brings me to want to look for more motifs (and at these too) to see how the biblical authors use them for a purpose. I would enjoy reading your Samuel motifs book if you were to ever write it. the article on Samson makes me think of how big and powerful god had made Samson. to call him little sun or sunny. somehow makes me laugh a bit. but on a more descriptive word god made Samson strong, powerful and a man whom many were unable to control. the fire motif brings me to think of the sun itself. just of how big the sun is in size, just like Samson. of how powerful it is, just like Samson. people were unable to control Samson. this is the same of the sun. we are unable to control the sun in any way. I know Samson was killed by the falling of the temple. but by this no-one could control him. Thanks for your insightful comments Jason. Hi Randy. Thanks so much for the website.😊 I love to learn new things from God’s word. Concerning the fire motif and the Samson account, I am thinking perhaps the fire motif symbolizes God’s judgments on His adversaries since fire in many other passages is a word associated with judgment. (Isaiah 66:15, 16; Jeremiah 5:14; Ezekiel 30:14; Amos 7:4) This would seem to make sense since Samson was raised up by God to judge Israel’s enemies and it is God exercising judgment through Samson as he did with each of the judges. Concerning Samson’s name, I am reminded of the light of God’s countenance shining on His covenant people to bless them. They certainly didn’t deserve His blessing in the period of the judges, but for the sake of their father Abraham, God shines the light of His covenant love through the person of Samson bringing about their deliverance – a foreshadowing of the shining of God’s Son, Jesus Christ, the True Light come into the world, on an undeserving and rebellious human race to free them from their captivity and bring them home to Himself. Through Jesus, God judged His adversaries. Unlike his son Jonathan, Saul chose to fellowship with darkness rejecting the word of the Lord. In the accounts of David and Hannah, desperation comes to mind. They chose to fast because their grief prompted them to humble themselves ( of which fasting is a picture of humility and dependency) and turn to the only One who could help them. They needed to hear from Him. They needed God’s Word. Thank you very much, very interesting. I have a question, what are your thoughts on the water motif in Moses narrative? Thanks for your comment and question. I am aware of the water motif in the story of Moses but I have never investigated it. I can offer a few ideas off the top of my head. Actually I see several possibilities and perhaps not every mention of water in the Moses’ story makes the same point. In the birth story where Moses is placed in an ark and laid on the water there is certainly a connection with the story of Noah. The Hebrew word for ark only occurs in those 2 stories and just as Noah was saved through water and brought salvation to the world (through his and his family’s survival), so also, Moses was saved through water and became a savior of his people. The dividing of the Red Sea probably brings to mind the ancient idea of the sea representing chaos. God’s dividing of the Sea through his servant Moses shows his dominion over the forces of chaos and using the sea to destroy the enemies of his people. Moses drawing water from a rock may be a statement of life-giving provision. Of course one of the dangers of wilderness travel is not having a continuous supply of water. The provision of water from a rock shows God’s faithfulness in providing for His people through His servant Moses. There is more to all of these stories of course, and I’m sure I’ve left out other instances in Moses’ life that involves the water motif. As I mentioned above, I have not done any study on this particular motif. These are just thoughts off the top of my head. Out of curiosity, do you have any thoughts on this? I also invite any thoughts by other readers of this blog. Thank you very much for replying, I benefited a lot from your page. Well, I have some thoughts which I can share, maybe someone will benefit from them. Somewhere I’ve read that water represents the ancient practice known as ordeal by water. In this motif, the ability to survive being submerged in water is regarded as a sign of innocence, while drowning means the person is guilty. So, maybe water represents God’s judgement. Also, Moses meeting his future wife at a well maybe symbolizes fertility, as Rober Alter suggests? For some time I thought water represents giving of new life, it seems to me that the New Testament picks up on this motif and develops it further. Now that you mention it, I do recall Alter making that point about the meeting at the well. I think you’re right about water being a symbol of life in the NT. Certainly Jesus uses it that way several times in the Gospel of John. Thanks for your insights and kind words Amar. God bless!